Founding Farmers is conveniently located on the edge of campus and is open throughout the holiday season. If you’re in D.C. for Christmas, you might find an eerily quiet city. Most restaurants that are bustling throughout the year shut their doors for the holiday, but from traditional Chinese food to a fancy meal at a Michelin-starred restaurant there are still options to dine in the District – even walking distance from campus. If you haven’t been to Founding Farmers yet, it should be at the top of your Christmas wish list. The classic D.C. restaurant is conveniently located on the edge of campus and is open throughout the holiday season. The restaurant will serve their regular lunch and dinner menu which includes shrimp and grits ($20.50) and chicken and waffles ($17.50). It is no secret that this spot is extremely popular — Founding Farmers is the most booked restaurant in the nation on OpenTable. But even though you can often find a line out the door and wait times can be more than an hour long, you may be in luck with short lines this holiday or you can also snag a seat at the bar and order off the regular menu. 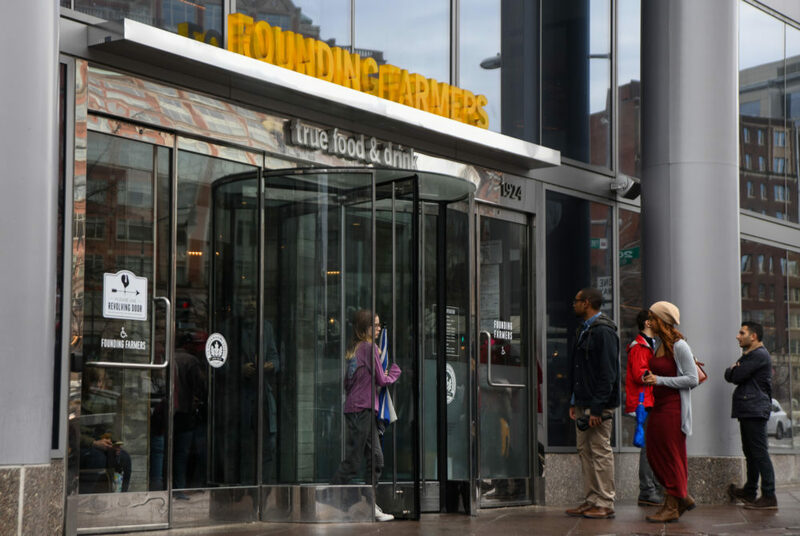 Founding Farmers will be open 11 a.m. to 8 p.m. 1924 Pennsylvania Avenue NW. For a truly decadent meal, opt for a three-course feast at Blue Duck Tavern, a lauded restaurant just off campus in West End. After an a la carte breakfast until 10:30 a.m., the restaurant will serve special lunch and dinner menus. Choose from appetizers including wood oven-roasted bone marrow and kabocha squash soup before indulging in holiday classics like glazed ham or pick the half-smoked goose with dirty rice and collard green kimchi for a change of pace this holiday. The meal, which costs $135 per person and $55 for children under 12, is the perfect choice if you are looking for an extravagant celebration. Blue Duck Tavern will be open from 11:30 a.m. until 8:30 p.m. 1201 24th St. NW. If you’re looking for a place to grab a meal in Georgetown before catching a movie or strolling by the waterfront to see holiday lights, Flavio will have traditional Italian meals ready for you and the whole family. Start off with classic dishes like calamari ($12), bruschetta ($9) or a caprese salad ($11) for the table or grab a pizza to share. For something simple, you can split a margherita pizza ($12) or try Flavio’s special seafood pizza ($20) piled high with shrimp, scallops and lobster meat – a perfect dish if you want an ode to the Italian Feast of the Seven Fishes. If you still have room for dessert, check in on Yelp and snag a free dessert like a tarte tatin, a caramelized apple tart with vanilla ice cream. Flavio will be open 11:30 a.m. to 11 p.m. 1073 31st St. NW. If your Christmas Day tradition consists of scarfing down traditional Chinese dishes, City Lights of China in Dupont Circle is your best bet. The menu offers a long list of appetizers, entrees and rice and noodles. From spicy wontons ($7.95) to chicken corn soup ($4) and pork dumplings ($7.95), you can start with appetizers and move onto entrees to share with the table like crispy duck ($16.95). If lo mein is your go-to dish, change it up a bit and try seafood pan fried noodles ($15.95). City Lights of China is affordable, offers delivery and has a large menu with a multitude of dishes to cover your table. City Lights of China will be open 11:30 a.m. to 10 p.m. 1731 Connecticut Avenue NW. For a more contemporary take on Chinese food, check out this Chinese-American a la carte feast at American Son. The restaurant, which is located inside the lobby of the recently opened Eaton Hotel, is the perfect spot for a trendy Christmas meal. The menu is inspired by dishes Chef Tim Ma grew up eating like kung pao pork belly with cashews and celery ($18), scallion pancakes with sweet tamari sauce and sesame seeds ($8) and chinese broccoli ($12). Diners can also purchase a whole roasted dry aged duck ($80) cooked in a pizza oven for a large, sharable dish. For the holiday, the entire 13-item menu will be available for just $250 and can feed the entire family. American Son will be open 11 a.m. to 9 p.m. The Christmas menu will be available from 5:30 to 10:30 p.m. 1201 K St. NW.